Thursday May 4th, 4:00 p.m. – 7:00 p.m. 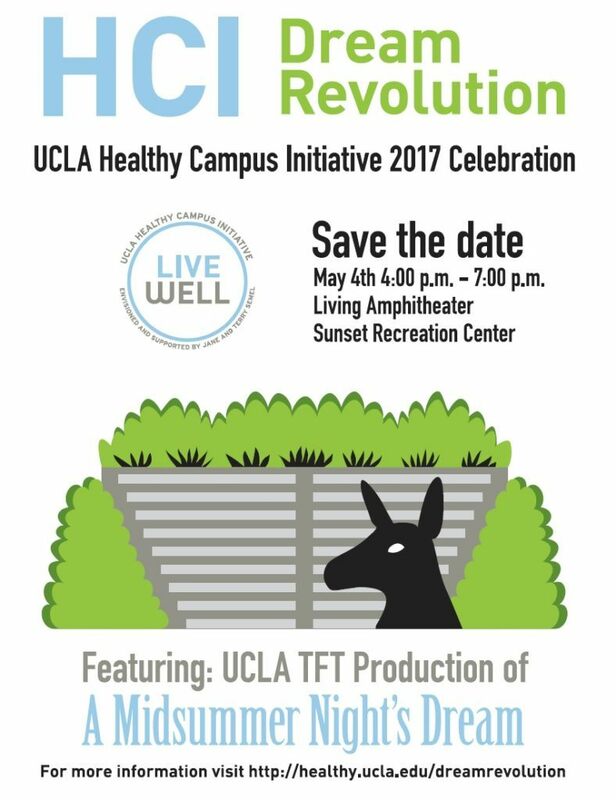 The Healthy Campus Initiative, envisioned and supported by Jane and Terry Semel, invites you to celebrate the Grand Opening of UCLA’s New Living Amphitheater! Located inside the Sunset Recreation Complex, this venue provides a welcoming space for our campus community. The Amphitheater has literally come alive with 31 community garden boxes tended by UCLA students, staff and faculty. The event will feature a high-energy contemporary adaptation of Shakespeare’s A Midsummer Night’s Dream, Directed by Joe Olivieri, Head of UCLA’s Undergraduate Acting Program, and featuring rising-star actors and designers from UCLA’s Department of Theater. Envisioned and supported by Jane and Terry Semel, Healthy Campus Initiative (HCI) is committed to making UCLA the healthiest campus in America. The UCLA Healthy Campus Initiative has grown into a powerful well-being movement, not only on the UCLA campus but is now being expanded across the entire UC system!